Use any mix of large and small files and store as many files as you need. There is no practical limit with Qumulo’s advanced file-system technology. With QF2, you can use any mix of large and small files and store as many files as you need. 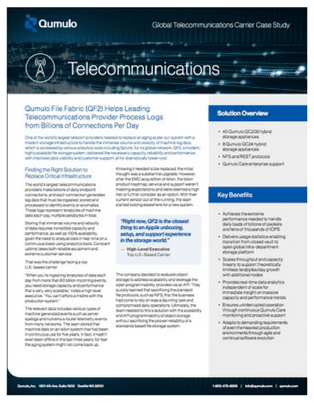 There is no practical limit with Qumulo’s advanced file-system technology. Many Qumulo customers have data footprints in excess of a billion files. QF2 is vastly more efficient at representing and protecting small files than legacy scale-out NAS, typically requiring one third the storage capacity and half the protection overhead. QF2 uses block-level protection and other advanced technologies. Because it operates at the block rather than the file level, it doesn’t have to protect each file individually, which also contributes to its scalability. Watch a demo of QF2 running with over 10 billion files. You will see how the integrated analytics in QF2 provide instant, actionable information about your file system, even into the petabyte scale with billions of files. One of the world’s largest telecom providers needed to replace an aging scale-out system with a modern storage infrastructure to handle the immense volume and velocity of machine log data, which is accessed by various analytics tools including Splunk, for its global network. Learn about QF2 with tutorials and trial versions. Stores billions of files in your data center or in the public cloud. Highest performance file storage system anywhere: On premises or cloud! Costs less and has lower total cost of ownership than legacy storage appliances.